Just to clarify, in a separate and easy to find post, EverGreen Farm is no longer in operation. I have come to the hard realization that I cannot operate this farm in our current situation. Shain's teaching job is far more work than it was when we started farming 15 years ago and he is basically unable to help with daily farm work while teaching. More than half of our farm season overlaps with the school year and I've done my very best to keep this place going to our high standards, but it hasn't been easy. Now that we are new grandparents and our son has joined the Army, we have decided to enjoy a new chapter in our lives. Thanks for your support over these last 15 years. A nice little share to end the season with, especially considering all of these items have somehow made it through multiple nights with temps dropping to the single digits! And, it's nearly the end of October. 24 weeks of fresh produce grown at 6,500+ feet elevation in Smoot, Wyoming. Something to be proud about for sure! I'm also very happy to say that our garlic was planted today! Yahoo! Next big end-of-the-season project will be taking down the plastic cover from greenhouse 4, which should happen this Saturday. Even with all the time Shain & I have had to spend away from the farm attending to family priorities, we are actually ahead of schedule for farm cleanup. Garlic - our regular garlic @ $10/lb, and the "ugly" (discolored) garlic @ $7/lb. Carrots - Shain planted an extra row of carrots in greenhouse 2, which we have only started to dig from. I am willing to dig up carrots for people with a little heads up. $5 for a generous big bunch. Two things - your carrots won't be washed (sorry, I need to turn off the outside water very soon) and eventually the snow will be too deep so this offer is only until I am tired of shoveling snow to get to greenhouse 2. Beets - There are also some beets still in greenhouse 2. $5/bunch. Same caveats as above - they won't be washed and only for a limited time. Onions - I know you've been given a lot of onions in your shares, but we have some left that I can sell. And now for some big news - It's with a lot of emotion that I inform you that after our 15th year of farming, Shain & I will not be running our CSA next year. We've known this outcome was coming for a few years, but I've been holding on to the dream and doing my best until I too know this is the right decision and this is the right time. I am SO very proud of this farm. I am SO very grateful for our Workshares! I will miss this. We have put the word out to various people that we would consider letting someone else operate a full scale farm at our location in Smoot. I have high hopes that the right person will come along and continue working this land the way our family has for all of these years. What is in our future? Well, we are grandparents now! And the desire to go visit family has never been so strong (at least for this Grandma!). Also, our son Eli is enlisting in the Army (he leaves in a few weeks). His new adventure will give us the opportunity to do a bit of traveling (something Shain has been wanting to do for years!). Otherwise, we don't have any solid plans for next year. We planted about half our usual garlic crop, a project we feel we can handle ourselves, with the intention of selling a little on the side. We will grow a big garden for ourselves. We are thinking of converting some greenhouse space to grow boxes with grass pathways for doing Yoga outside on a sunny day in the middle of the winter. You know, crazy ideas like that. Thanks to you all for your support. Thanks especially to those who have been with us for all these years! Fresh Dill - too much? dehydrate or freeze it! Walla Walla onions aren't necessarily a storage onion variety. They have a high water content and can't "cure", like the kind you see at the store that last months and months. However, they can last several weeks if stored well. We have successfully kept onions in several ways. Some of our Workshares recommend the trick of hanging them in nylons. Right now, I have about 20 onions in a large glass casserole dish on my counter top and they will last a couple of weeks this way. My last harvest of the season will likely be kept in a wire basket in our basement and I expect them to last about a month that way. Some of the things to avoid is keeping them in airtight containers or in contact with anything "natural" (cardboard, wicker, wood, etc.) that could cause molding. These onions also dehydrate very well. The carrots and beets had to be topped this week because of the condition of the greens at the times we needed to harvest. The tops were frozen (and would likely go rotten quickly) so we topped things and bagged up separately. One benefit of them being topped already is that they will store longer in your fridge. Untie the bag and allow for a little "breathing" (air flow). Both items should store well if topped and not kept in a soggy bag. We have a heater in with our tomatoes so they are still alive and giving us a small harvest each week. 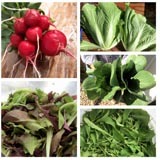 NEXT WEEK, October 25th, will be our last CSA pick up for the season. ONE MORE SHARE! There is still some of everything you see above (except the potatoes) and we plan to make it a big share one more time. Happy to report that my daughter and grandbaby are doing well. A BIG thanks again to our great Workshare crew who covered my chores and the produce harvest last week - in the SNOW and freezing temperatures. Great people! Thanks to our crew of great Workshares who covered a week of farm chores, projects, and CSA harvesting while Shain and I were out of town attending to urgent family matters. We are now the proud grandparents of little Bella Rose Garofalo and soon to be military parents as our son has decided to enlist in the US Army. Yes, it's been a busy, emotional time for our family. Another great share of veggies and herbs weighing in at about 14 pounds and at a value of $40! What a great year for growing a bounty of good food! And... looks like the weather is going to throw us a curveball for the next week. I see snow in the forecast, but my biggest concern are the nighttime temperatures. Hoping they stay mild enough that row covers, extra row covers, can help pull things through for a few more weeks. As I mentioned last week, I plan on having CSA shares through October 18th. Maybe a week longer if we have enough food and nice weather. The tomatoes are just starting to ripen. It's so frustrating to baby them along all these months and still take so long to ripen. So, today Carol picked all the red tomatoes she could find and also all the green tomatoes off of a few plants towards the back of the greenhouse where the heaters can't quite reach. I know some of you like green tomatoes. If you don't, just leave them out and they'll likely ripen, eventually. In addition to a great harvest each week, we are also making progress on end of season clean up work. It's a big job to shut a farm down for the winter! I'm so grateful and happy to see the projects get done with the help of our great workshare crew. Recipe ideas? Make soup! Shain has been cooking some great soups. Even a simple recipe can taste delicious and uses up a lot of the items in your weekly shares. I know a few of our CSA members who make large batches of "CSA Soup" with their leftover produce, putting most of it into the freezer to enjoy all winter long. We've reached week 20 in the CSA season and it seems like time is moving very quickly. When will the season end? "About the middle of October" is what we plan for at the beginning of the season, keeping in mind the many uncontrollable factors that will ultimately bring the season to an end - some of which are the weather (freezing temps, snow, ice, etc. ), how much food is available to harvest (doesn't seem to be a shortage this year, unless the weather kills things off more quickly than anticipated), and how long our Workshares can continue coming to help (so far, so good, but working in bad weather takes a toll on people, luckily that isn't happening this year). So, with all this in mind, I'm fairly confident the season will continue through October 18th. Shain posted another great recipe this week - he calls it EverGreen Farm Roasted Golden Beets and Kale Salad. 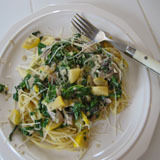 A delicious recipe made with ingredients from this week's CSA share. This is a vegan recipe, but I'm sure it will also taste good with non-vegan substitutions. Another recommendation for cooking with the items that are growing so well on our farm this year is to learn the art of making Mirepoix, which is basically a mixture of cooked vegetables that are the base ingredients for adding wonderful flavor to soups, sauces, stews, pasta dishes, etc. Shain also likes to make the Spanish version called Sofrito (which uses slightly different ingredients). Honestly, incorporating this simple cooking technique has brought Shain's cooking up to a whole new level. (I'm his very willing taste tester!) My links take you to the Wikipedia pages for basic definitions, but further searching will surely lead you to some great recipes. This week brought some very cold temperatures that required several nights of extra work in the greenhouses. I'm happy to say that most everything survived well. I took all of the basil before it had a chance to die (I don't think it would have made it). The bronze fennel (growing outside) also froze and is done for the year. The French filet beans look frozen, but there were still a lot of good beans to pick underneath the frozen upper leaves. The kale is looking a little rough, but not so bad we couldn't pick from the plants another time. I think they will bounce back. Otherwise, I'm really happy to see the extra hard work paid off! Whew. That was a lot of work. And now it's going to warm up again for a while. The zucchini & squash have succumbed to the cold temperatures. Nothing worth harvesting from these plants anymore and I could really use that row cover to protect another row of crops that will survive a little freeze. Yes, it's that time of year. I call it "Robbing Peter to pay Paul", where I make hard decisions like taking row covers off some plants so I can double them up on others. It's been a very nice stretch of warm weather and Mother Nature appears to be making a drastic change in the coming week. I'm ready and we'll do what we always do - close everything up tight at night, turn on heaters, and get out all the row covers! All of our potatoes are out of the ground! And, our north field is cleared and ready for the tractor to come in and till up the earth. When the tilling is done, we'll plant garlic and then that patch of the farm will be done for the winter. We are starting a few other clean up jobs here and there as time permits. It feels strange to be pulling things up already, can we really be approaching the end of the season? Yes, it's true. My body tells me so every night when I crawl into bed. We'd love some extra help on Wednesday evenings and maybe some Saturdays. Last call to come play in the dirt with us. Soon, it will be all over. Broccoli - watch out for green caterpillars! We dug up one more row of potatoes this week, only one more to dig next week. This week's variety are called French Fingerlings. They grew very well for us and are a real treat to eat. Fingerling potatoes are the type of potato you sometimes see at the store that are smaller in size and a lot more expensive. Why the increased cost? For starters, the certified fingerling seed potatoes are very expensive, the conditions to grow them well have to be just right (we tried growing some last year with low yields and small potatoes, they liked this warm summer much better), and it takes twice as long to dig them up. We grew two varieites of fingerling potatoes this year, kind of as an experiment and kind of because Shain loves them so much and is determined to figure them out. So, you get to enjoy his little experiment too! Our broccoli didn't quite turn out as expected. I have been watching it carefully these last few weeks, peeking under the row covers to see how things are growing. Last week, I only saw smallish, compact heads with a yellowish color. So I left them to grow another week. Then I pulled off the covers this week and was surprised to see that so many heads had seperated (started to bolt), and curiously, the color isn't turning the dark green that I'd expect. So, I'm calling this "Soup Broccolli", the kind you will cut into smaller pieces anyways to make a wonderful broccoli soup. Meanwhile, the cucumbers are going gang-busters. The zucchini are just about done. I didn't find many full grown squash this week, just enough for everyone to get one, but the plants are still loaded with very small squash, so I'll keep covering and picking them. It's good to see a good crop of head cabbages! There will be a lot more cabbage in the weeks to come. And the fillet beans are also growing faster than we can pick them. So much great food to eat and cook with. Shain has been making us some delicious recipes, including this White Bean, Carrot, and Kale Soup (click for the recipe). Another pound of our brownish looking "ugly" garlic. This is all the CSA members will get for the season. I will have more available for purchase (to help cover some end of year farm expenses). Our basil is showing signs of stress from going back and forth between freezing and really hot (inside the greenhouse), so I cut back most of the plants for a nice big bag for everyone. There are some brown leaves you may choose to discard, but there should still be enough to make a big batch of pesto (one of my favorites). Or, if you can't use it all in a week, maybe chop some up and put in the freezer for later. We started digging potatoes this week. Half of them are out of the ground and in boxes in our basement. You'll be getting a bag of potatoes each week for as long as they last. This year we planted Red Norlands, Yukon Golds, and two kinds of fingerlings. One row of each and they appear to have done very well. Quote of the week here on the farm: "I think this has been your best year ever!" You know, it's hard to remember from year to year, but this may be true. This has certainly been a great year to be a member of our CSA. It's one month away from when our first grandchild is born. Everytime my daughter calls, my heart races. When the moment comes, I am to drop everything and drive to Ogden to be there. And I look forward to it. I'm putting several plans in place to have the farm harvest continue in my absence. It's a very busy time to leave, but we have a great crew of workshares who I'm confident can fill in for me as needed. 1 pound of "ugly" garlic - not pictured, oops!